The first time I watched a centerpin in action was when I was fishing on the Credit River. It was the early 90s and I was attending college north of Toronto. I would often make the drive down nearly every weekend to visit friends, go clubbing and of course fishing. Growing up in Northern Ontario, I first cut my teeth fishing for steelhead on the St. Mary’s and the streams along the east shore of Lake Superior. The streams of Lake Superior were vastly different then the streams around Toronto. At the time, I was strictly a fly fishermen who employed bottom bouncing and sink tips. I was walking back after a day of fishing when I saw two anglers using very long rods and floats. Intrigued, I walked over and asked them what type of set up they were using. They told me it was a centerpin. It resembled a large fly reel and I noticed it was free spooling. I asked them if the reel had a drag and one of them told me no. The rod had to be about 15’ long and they were fishing a pod of kings in one pool. They were using small floats with single eggs. I asked them how much it cost for the gear and one of them told the reel was expensive and he bought it from a shop in England. As a college student that barely had enough money to make it from semester to semester, buying an expensive rod and reel was out of the question. That was the last time I would talk to somebody about a centerpin. During my time in school, I would see them from time to time on the rivers. Back at home, I would ask my fishing friends about centerpins and none had a clue what I was talking about. In 1998, I had the opportunity to move to the U.S. Me and my fiance moved to the Cleveland area and I started to look into the fishing prospects. One day during the spring, we were walking along the Grand River and I noticed several anglers fishing. I walked over and I could see them fishing the faster water. One them hooked into a fish and I watched a large steelhead jumped from the water. 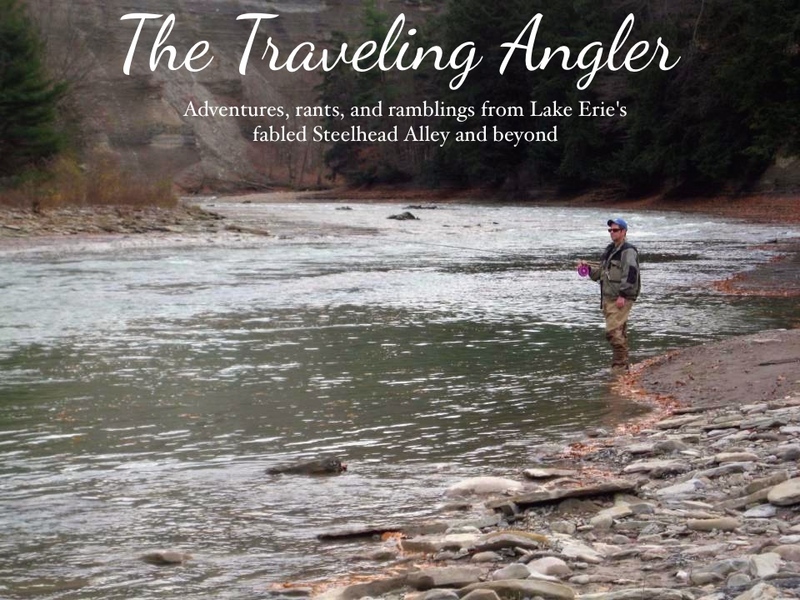 At the time, I didn’t even know Ohio had a steelhead fishery. I remember from my junior ranger days at Turkey Point that people fished for salmon off of Long Point. It sucked being stuck on the sidelines as I sold all of my fishing gear before moving to Alberta the year before. During the summer, I saved my money to buy some new gear. During the summer, I scouted the several rivers in the area and noticed all of them were relatively shallow and they ran over shale. They ran gin clear most of the time, except for the Grand. The deeper pools were fairly slow moving. It reminded me of the rivers back in Southern Ontario. I decided to purchase both a fly and float rod. During the first couple of years, I found the float rod was better suited as most of the fish were found in the deeper water, especially during the winter. I mainly used the fly rod during the fall and spring. But, I was limited with the spinning reel as I had to continually open and close the bail when running a float. I needed something better and that when I started looking into getting a centerpin. 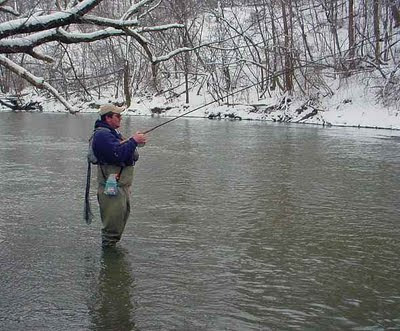 At the time, pinning in Ohio was only done by a handful of anglers. Nearly all of them bought their gear in Ontario as none of the tackle stores in the area carried them. I started looking on the internet and one place where I found a centerpin was Ebay. It was a John Milner Kingfisher and a 13’6” Raven float rod. There were a couple of days left before the auction was over. Oddly, there was very little interest generated and I was bidding against five others. It was a tense two minutes and to my joy I won the auction. I was now the proud owner of a centerpin. I got both the rod and reel for $225.00 and it was a bargain as I would later find out that the reel alone would go for $399.00. A few days later the package arrived. Inside were a box of floats and a small book on float fishing. At the time, there were no books on pinning and very little information on the internet. I was left to my own devices and it would be trial and error. After work I would go down to the Rocky River and practice. I no idea how to cast and I looked at the reel and tried to figure out what would be the easiest method. For the first several weeks, I began to wonder if it was worth the money invested. I found myself fumbling and cursing with the tangles, bird's nests and short casts. By now it was almost the end of September and I still struggled. I found the easiest way to cast by pulling the line off the spool and side casting. It was very simple, but I noticed a big flaw – line twist. The more I used the side cast, the more the line started to twist. I combat the problem I would cut the twisted line and retie. This was a waste of line and I had to find a better way. I began to research on the internet and I found a website from England. The British were the ones to invent the centerpin. They primarily used the centerpin for carp and bream. In the videos, one cast caught my eye and it was the Wallis cast. The one advantage of the Wallis cast was it didn’t create line twist, but it was a more difficult cast to learn. I watched the video several times and tried it in the back yard. The first several attempts were pathetic as I had to untangle wads of bird nests. My timing was terrible and I had to slow down the process. The key to the Wallis cast was timing. I continue to practice and I started to see the fruits of my labor. I started get longer and more accurate casts. I felt confident enough to try it out for the upcoming weekend. I drove to the Grand River and started off at one my favorite pools. I took a deep breath and made my first cast. I effortlessly casted out 50’ and got the float where I wanted it. I was pleased and watched the float head downstream. The line came off the reel with little resistance and it covered the entire pool. I worked the pool and made several adjustments. After 30 minutes, I finally got my first fish on the pin. The float popped and went under. I set the hook and the fight was on. It felt like a large fish as I gingerly palmed the reel. I gradually applied more pressure on the reel. I felt like I had more control of the fish as I didn’t have to rely on a drag. I managed to get the fish to the net it was nice male. 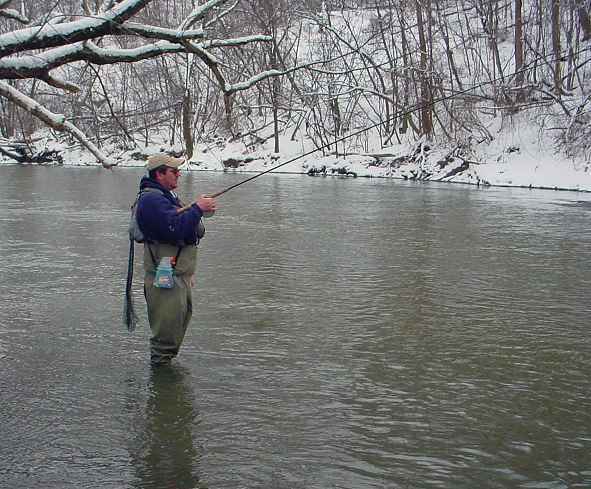 That was almost 6 years ago and today you’ll see some angler on any of Ohio’s steelhead rivers using a centerpin. In the past couple of years it has really taken off as several tackle stores carry several models. I’ve taught a lot of guys on how to use a centerpin. I rarely even use the fly rod anymore. I find the centerpin is better suited for the streams along steelhead alley. Hopefully this fall I can retire the Milner and replace it with a new one.